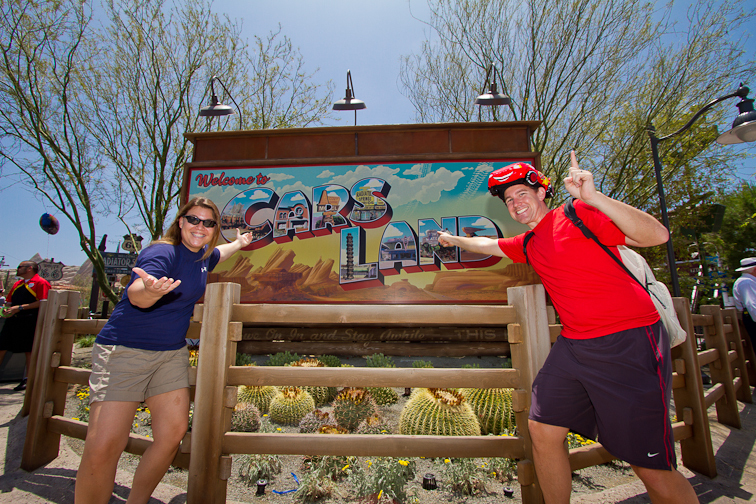 Tales of the Flowers: Cars Land is open! 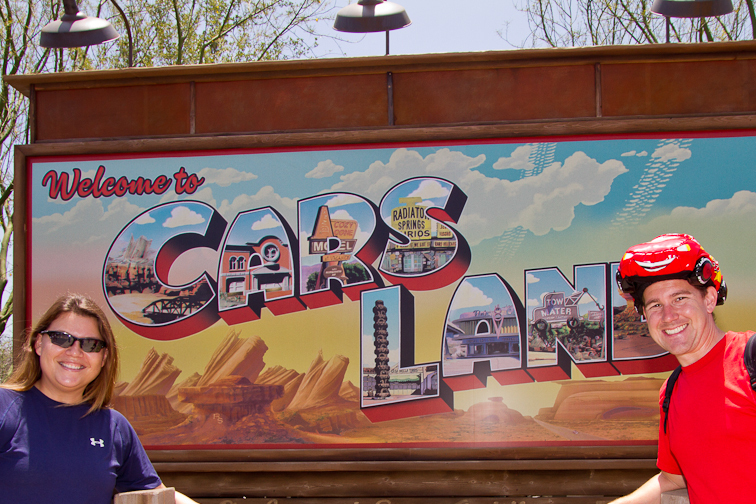 After so long waiting, Cars Land is finally open! We were trying to decide if we should go on opening day, June 15th or the next day. In the end, I think we made the right choice. 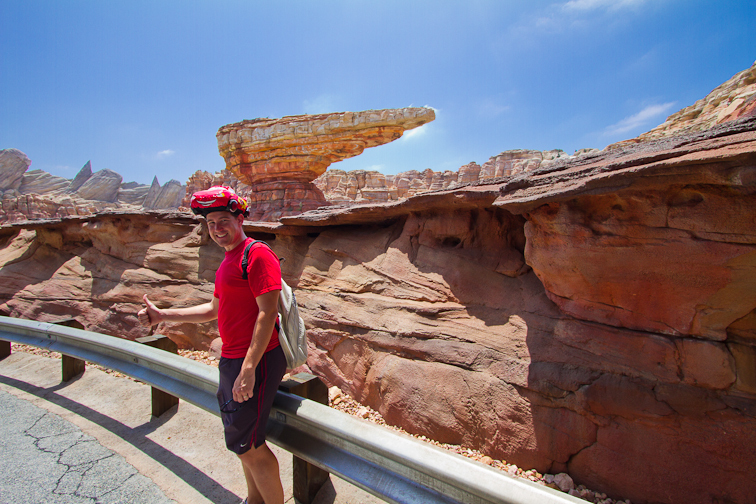 I heard there were massive lines and huge crowds for opening day of Cars Land. We arrived to the park right around 11am. We drove right up to the parking structure and didn't have to wait in any lines to park. So far so good. We walked right up to a tram and immediately boarded. Even better. The day is going great so far. 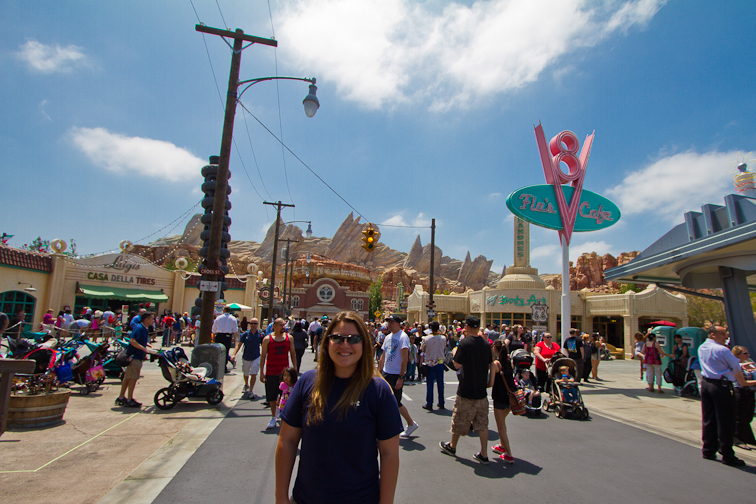 We walked to Disney California Adventure and again there was no line to get in to the park. 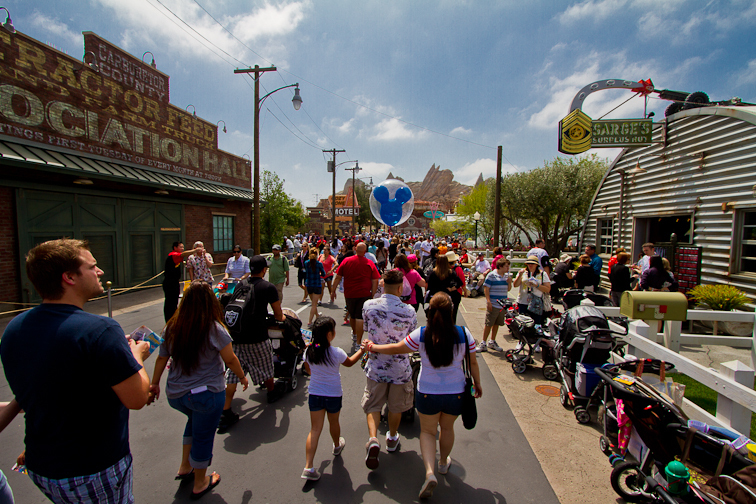 Buena Vista street looks great! All the new buildings and shops look great. 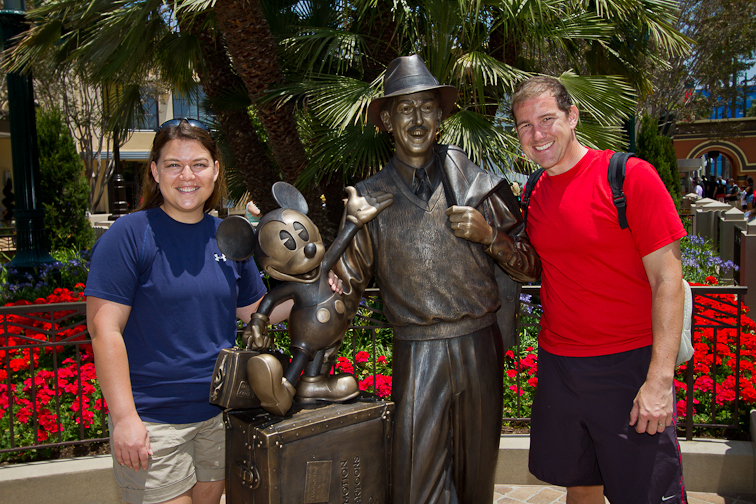 We like the new statue of Walt and Mickey. There was a line for photos so we didn't get to examine the statue that closely, but it is cool that you can walk right up to it. 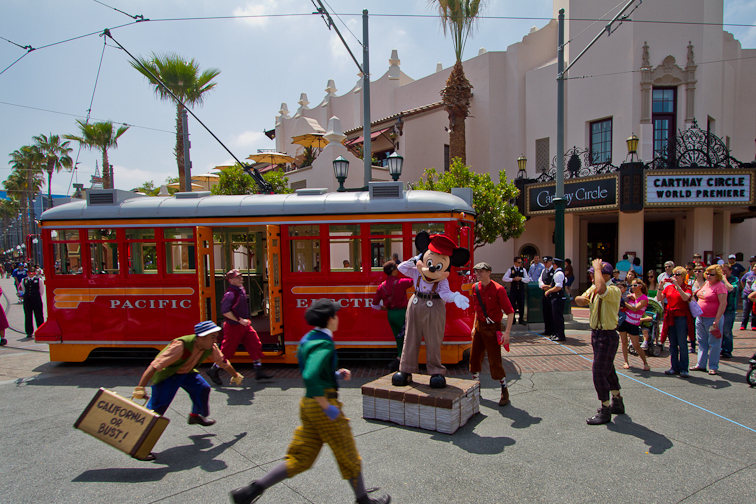 We watched one of the new shows on Buena Vista street. Lots of singing and dancing, and Mickey Mouse even talks! He moves his mouth and blinks his eyes along with singing and dancing. 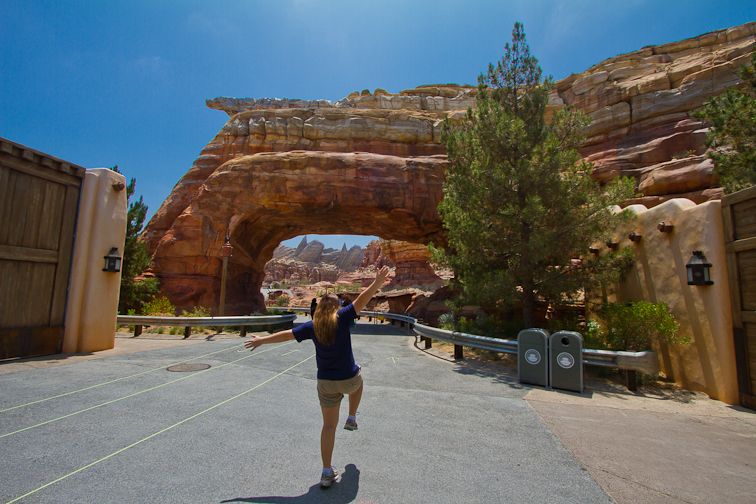 We walked back to Cars Land, but of course Theresa stops off at the fruit. 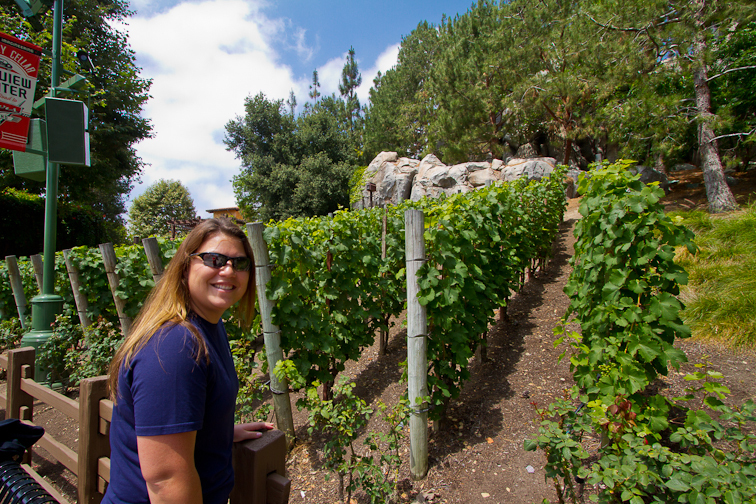 Here's the grape vines growing by the winery. It might look crowded, but we've seen much much worse. Considering how new this place is, we were thankful that there was some breathing room as we were walking around. The place looks like it came straight out of the movie. 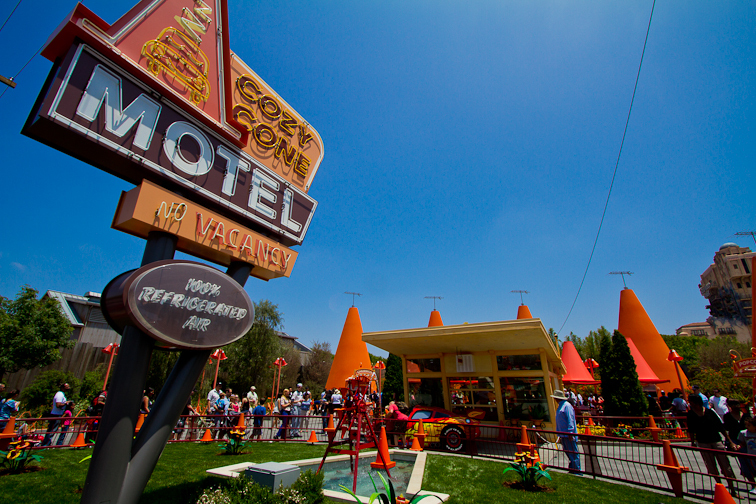 The Cozy Cone Motel has some great food selections. Each cone has a different selection. We went to the one with different popcorn flavors. We loved trying all the flavors when we were in Japan, and when we learned they would be making a few different flavors here, we were excited to give it a try. We bought the Dill popcorn flavor, and it was actually pretty tasty. No so pickley and just a yummy savory flavor. 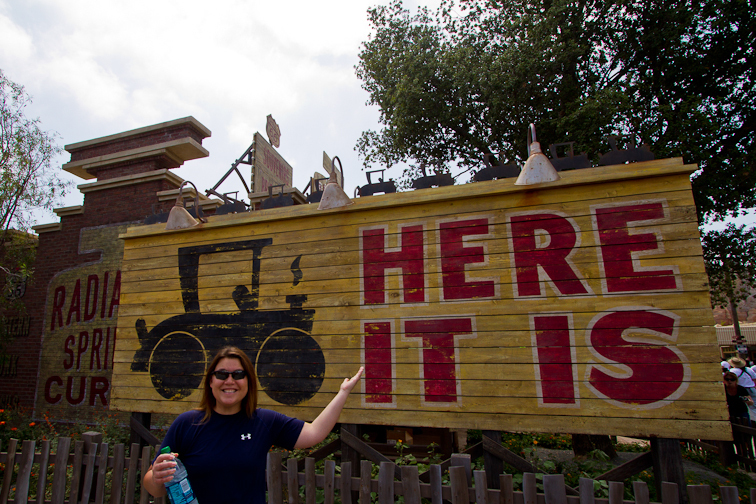 I also got a Doc Hudson Grape Tonic that was great! 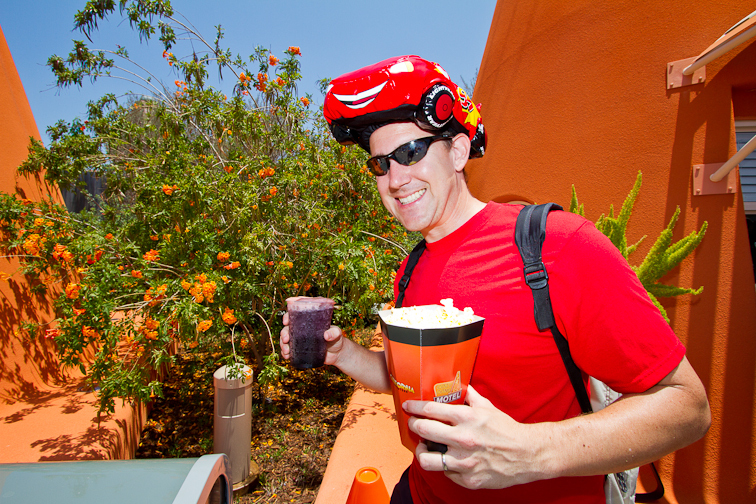 One of the really popular hats based on one of the new rides in the park. Luigi's Flying Tires. 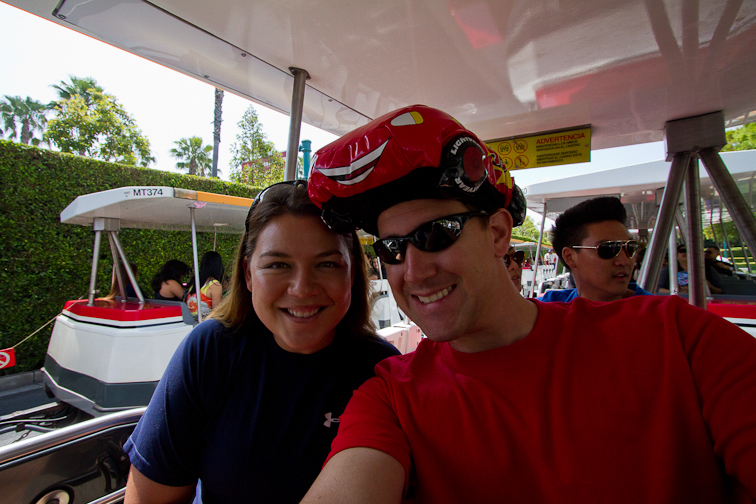 I wore my Lightning McQueen hat that I bought from Disneyland a year or more ago. I got comments on it all day and lots of people asked where I got it. 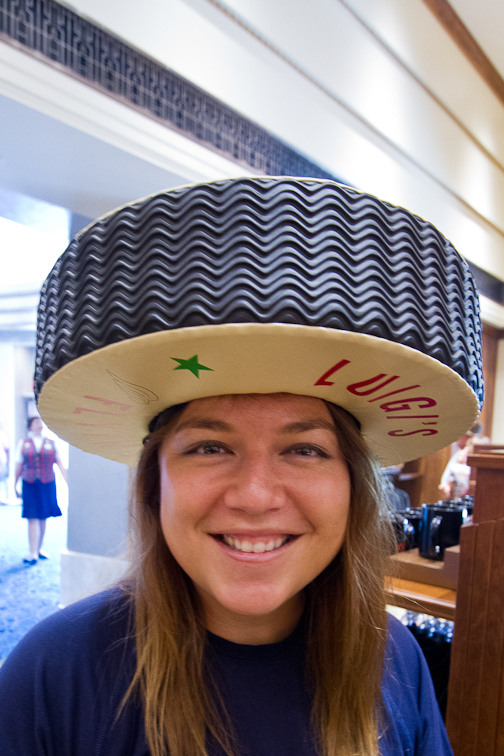 I was a little surprised they weren't selling these hats, but was happy because mine was unique. The whole rest of the day I didn't see another person wearing it. Theresa's excited to be walking into Ornament Valley. We didn't end up going on any of the rides. 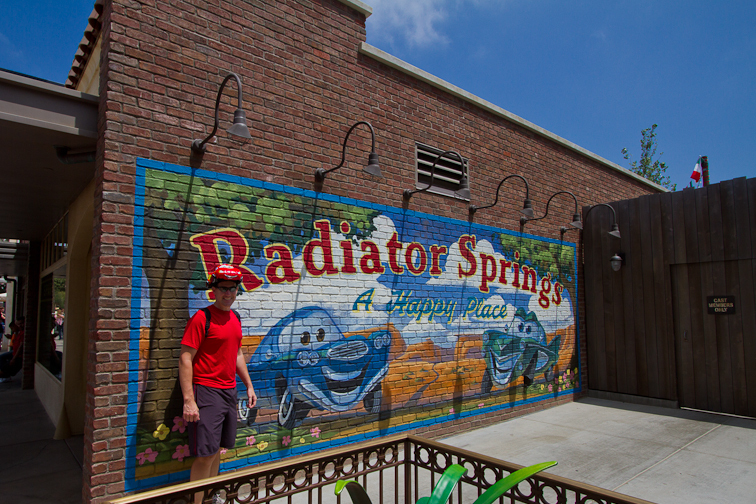 For the 3 rides, the wait times were 160 minutes, 90 minutes and 45 minutes. 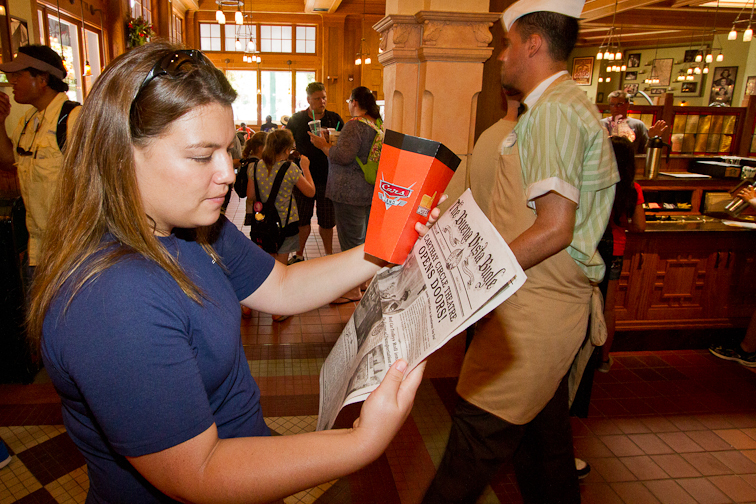 We'll go on them when it's a little less crowded, or when we can get a fastpass. Just hitchhiking along Route 66. Theresa felt like an iced coffee, so we stopped by the brand new Starbucks that has opened inside California Adventure. We ended up getting a Mocha Coconut Frappuccino that was tasty. 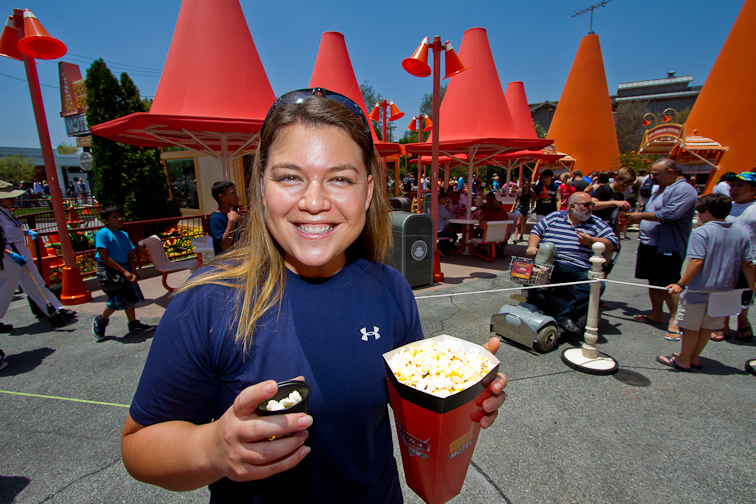 It wasn't just California Adventure that was getting new stuff. Disneyland was getting in on the game too. 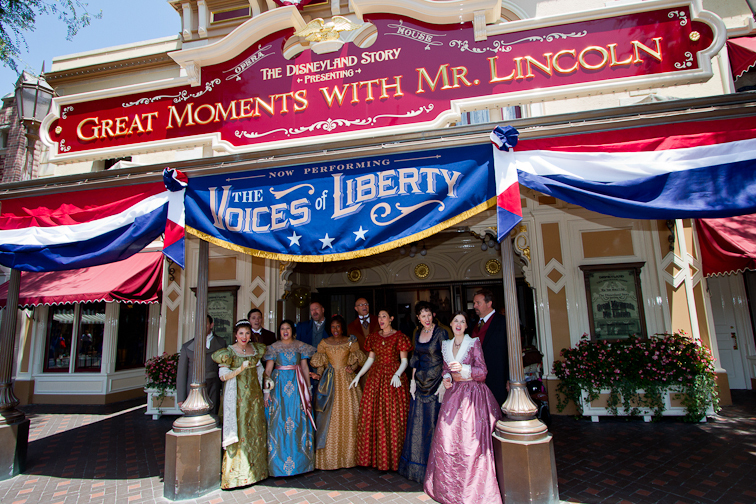 One of our favorite parts of EPCOT in Florida are the Voices of Liberty that perform in the American Pavilion. 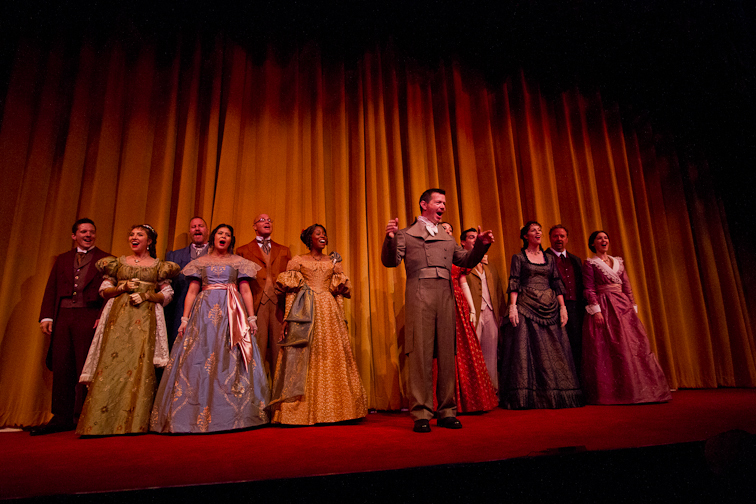 Well for a limited engagement, they'll be singing in the Main Street Opera house. They sing a couple songs outside to draw people in. Then they do a 15 minute show inside. Nice! We enjoyed it so much, we stopped by Guest Services and filled out a comment card telling them. Here's hoping they keep them past September 16th.